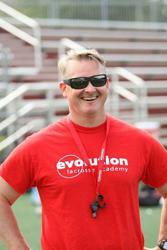 Matthew Podwoski is the Founder and President of Evolution Lacrosse Academy. Coach Matt is a high school administrator and certified teacher of Social Studies with more than 25 years experience in teaching and coaching in New Jersey, New York City and California. He currently teaches history at Boonton High School, and was previously Dean/Supervisor Elementary Instruction with the Boonton district. Matt holds a bachelor's in History and American Studies from Lafayette College and a master's in Latin American History from San Francisco State University. He is a lifelong lacrosse supporter, player and coach who is dedicated to sharing his love of the sport. He is a member of US Lacrosse and holds certifications in First-Aid, CPR and Concussion Awareness. He lives in Montclair, NJ with his wife and son, and their dog Bear.